There’s nothing like a dog — or two — to remind one of what is important in life. In Amy Linder’s case, her dogs Cody and Casey keep her focused, both in life and work. Cody and Casey are each gorgeous Dalmatians, and Amy is Eugene’s Deputy Fire Marshall. 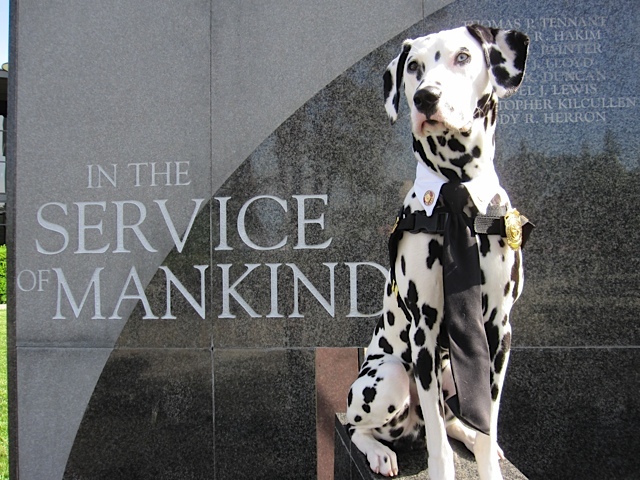 Dalmatians have a long history with the fire service . . . the tall and lean dogs were bred as runners to guide horse-drawn wagons, which fire trucks used to be. Linder also has a long history with the fire service . . . her father and grandfather were both firefighters. So it’s no surprise that Dalmatians are a big part of Linder’s life. Linder first began training 8-year-old Cody to demonstrate fire safety when she lived and worked for the fire department in Washington. She relocated to Eugene five years ago, and knew that if her public education program were to continue she needed a succession plan. “That’s when little Casey joined the ranks,” says Linder. Cody is still a puppy, but he’s passed his “probationary firefighter” status and is now a full-fledged firedog. “Casey had to start with basic training, all the things well-socialized dogs that are part of any family need to learn,” says Linder. “Once that was complete we started the tasks of the specific fire safety behaviors that are the keys to our public safety education.” Casey can demonstrate how to crawl under smoke, use a giant prop to demonstrate testing a smoke alarm, dial 911 (on a prop telephone), go to a meeting place, and stop-drop-and-roll. Casey is already excelling in his responsibilities. 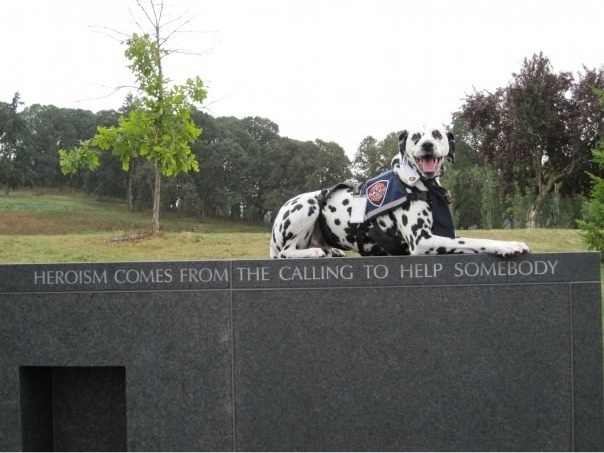 He spent much of October (fire safety month) visiting schools, and during the first weekend attended his first National Fallen Firefighters Foundation memorial weekend, which honors firefighters who die in the line of duty. “It’s a weekend about support and honor and recognition of these families,” Linder says. Cody has played a large role in that ceremony over the past three years, but now that he’s aging, it’s too big a trip for him, so this year was the passing of the torch. Casey also went to the state fallen firefighters ceremony, and his name is now on the roster of active Oregon firefighters. Posted in Feature, Behavior/Training, Safety and tagged with Training, Service Animals, Safety. May 1, 2013 by Vanessa Salvia - Spot Magazine.